Those of you who paddleboard or kayak understand the serenity of being out by yourself or with a friend. Although, most paddlers are restrained by distance knowing that they will need to return under their own power. There is so much more to explore with paddle sports, especially further away from shore…places where boats and even skiffs can’t get due to shallow depth or too narrow of a path. Using your boat to transport your kayak or paddleboard opens up a whole new adventure to where fish are not pressured. Paddleboards are becoming the choice of paddlers, because of the site advantage of standing. Coastal states have hundreds of miles of coastlines, which can be fished with the right watercraft. Some of these areas are designated as No Motor Zones, therefore you must use a paddleboard or kayak to fish them. All of these areas are quiet habitats for redfish, speckled-trout, snook, tarpon, and black-drum. No pressure from boaters means a great likelihood of multiple hook-ups. Imagine hooking up on a large snook or a giant red while on a paddleboard. It is an experience that will keep you wanting more. These monsters will pull you around until you are able to bring them in. 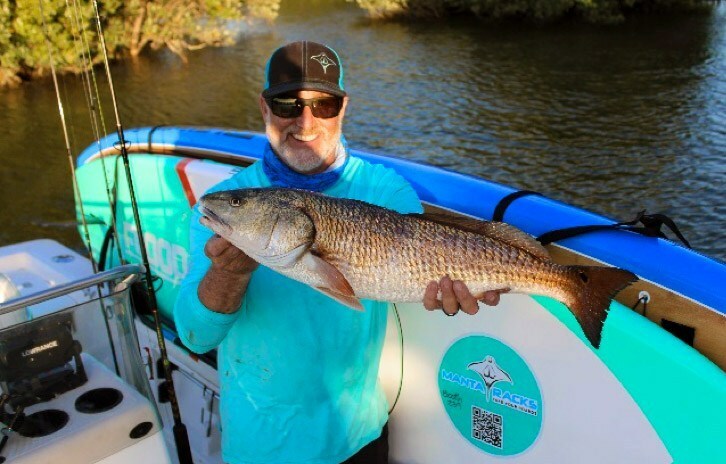 If you live in and plan to fish Florida on a paddleboard or kayak, read the article “Portage to Paradise” by Matt Arnholt in the Florida Sport Fishing Magazine. Matt does a great job outlining and describing Florida’s No Motor Zones, such as in the Everglades and along the Space Coast. Florida has hundreds of miles of coastline which can be reached by boats, but must be fished by paddling due to the remoteness. Places like Wacassassa, near Suwannee, FL you can fish for hours on end and never see another person. So, you can imagine the fish haven’t either. Being able to bring paddleboards or kayaks with you on your boat opens up fishing opportunities. If you have a bay boat or a deep V, but want to shallow water or flats fish, now you can do so without buying a flats boat or skiff. When you go Paddleboard Fishing and take your paddleboard with you on your boat using Manta Racks, you can get to remote places where the fish are not pressured. Using the boat as a base or mothership, you won’t have to bring all your lures, fishing rods, and other accessories with you on the paddleboard, just what you need to hunt for a couple of hours. The type of paddleboard or stand up paddleboard (SUP) you bring is key. It should be stable, have enough room to bring along some important items and be designed for paddleboard fishing. The fin(s) should be for shallow water, 4” to 6” long at most. Fish, such as redfish, are in very shallow water to feed and you don’t want your board to be stuck because of the length of the fins. Some paddleboards are wide enough to carry a small cooler for refreshments, a snack, and your catch. Bring along a stringer, just in case your catch is too large to fit in your cooler. With a stringer, you will be able to tow your catch back to your boat. If you have a board that can handle a cooler, place in the middle of the board, so that it can be used as a seat. Bringing at least 2 to 3 fishing poles allows you flexibility of having different presentations without having to tie on different lures. Whether you break a line (which you will) or to have different lures on each rod for different scenarios, you will have a backup and options. For safety, wear some type of water shoes just in case you have to step off your board. Wear a life jacket, use a leash, and carry a communication device such as a cell phone or hand-held VHF. You will be in some remote areas and may need to contact someone. To recap, the items you must bring for paddleboard fishing are a stringer, something to measure with, net, rope or stick pole for an anchor, polarized glasses, a drink holder, extra bait/lures, and 2 or 3 fishing rods with different presentations or baited ready to cast. Safety items include some sort of life jacket, water shoes, board leash, and a communication device. Consider a belly bag or fanny pack to carry some of these things. Remember, plan minimal but take the essentials; your boat won’t be too far away so you can go back to it should you forget something. Peter Hinck, AKA: Palm Beach Pete has a good paddleboard fishing safety video on YouTube. MANTA RACKS were designed to solve a long existing problem – to get your boards off the floor of your center console or other fishing boat’s floor and secure them. Our rack systems allow you to organize your boat to keep it clutter free, so that your guests can move freely without tripping over your boards and possibly being injured. “Mothership” – WIKI- A mother ship, mothership or mother-ship is a large vehicle that leads, serves, or carries other smaller vehicles. A mother ship may be a maritime ship, aircraft, or spacecraft.To us, “Mothershipping” is the concept of taking a large transportation vehicle (center console boat or yacht) to a distant location, to then take smaller vessels (paddleboards and kayaks) to places the Mothership cannot go.